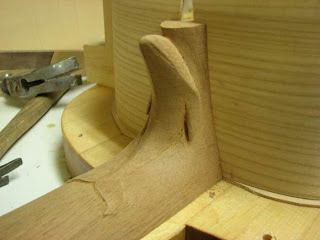 The heel on this old neck was originally carved for a slightly deeper guitar, so I had to cut about 6mm off the bottom, which required me to re-carve the whale. Which is OK because I feel that it is more refined now. But it did take extra time, which is something that I wanted to avoid. Oh well. It serves us no good to count the hours in the service of Art. 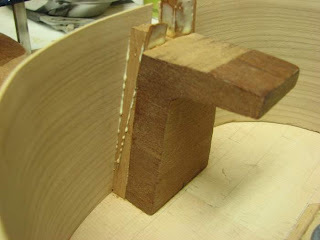 Finishing the carving allowed me to get the neck installed. One small "modernization" is my use of the double wedge instead of just the skinny slits. 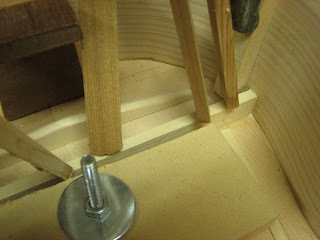 It is a little more work, but getting the little slits "just right" has its own complications. I really like how tight you can get the sides against the outer portion of the heel. Freshly glued in, I'll be cleaning it up later. Or not. Haven't decided. The Tornavoz will eliminate any opportunity to see how nicely shaped it is. I tried something new on this build. 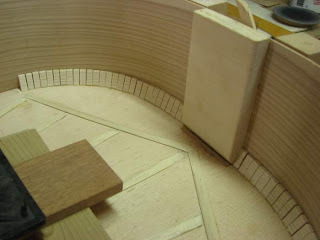 I've been thinking that it would be easier to glue in the harmonic bar after I get the sides on. I was right, it is MUCH easier to fit it into the sides than to fit the sides to the bar. Gluing it in is the same process either way. And now I'm gluing in the dentellones. Its easy to do, and is as fast to do as you can pick them up and glue them in. I'll be continuing this today, we'll see how long it takes. Once I'm done I'll be fitting the lining for the back. Posted by Doug Ingram at 8:44 a.m.